In this area of the Apparel Search fashion brand directory, you will find women's fashion brands from leading apparel companies and fashion designers. On this particular page, you will find information regarding women's clothing with the Vans brand. You are welcome to utilize this section of our clothing guide to review Vans news, Vans blog posts, Vans photos, and more. Vans is a leading footwear brand and does an excellent job with youthful fashion as well. The story goes back to the 1960's and has continued to develop year after year with interesting new trends. In 1966, Brothers Paul Van Doren and Jim Van Doren along with partners Gordon Lee and Serge Delia open for business at 704 E. Broadway in Anaheim, Calif. on March 16. The Van Doren Rubber Company is unique in that it manufactures shoes on premises and sells them directly to the public. The name House of Vans is coined Early 70s Skateboarders who like Vans' rugged make-up and sticky sole are seen sporting for the first time and is showcased on the windows of the Anaheim location. In 1976, The Vans #95, now known as the Era, with a padded collar and different color combinations, is designed by Tony Alva and Stacy Peralta and becomes the shoe of choice for a generation of skateboarders. Also, the Vans' "off the wall" logo makes its debut. Learn more about the women's Vans clothing & shoe brand at their website. 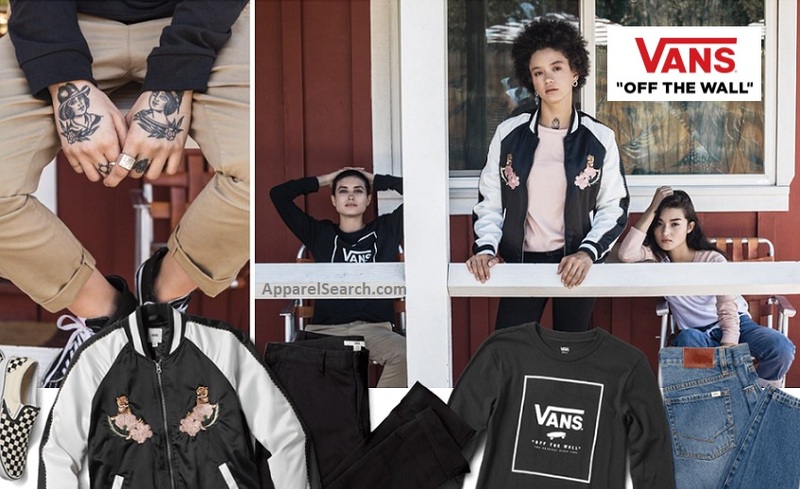 If you have changed your mind and do not wish to research the brand Vans, you can use the search engine on this page to find another clothing label that may be of more interest. Apparel Search is a leading guide to fashion, style, clothing, glam and all things relevant to apparel. We hope that you find this Vans page to be helpful.